This is big ..... no huge is a better description. Larger than 'life' and certainly bigger than the LC 100 series that it has replaced. But is big better? 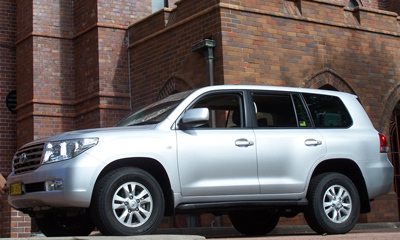 We took a mid-spec Toyota Land Cruiser VX wagon (200 series) for a 'run' around urban Sydney and Newcastle to gain an impression of Toyota's premium off-road machine. 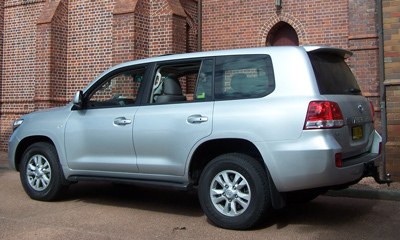 VX slots into the Land Cruiser line-up between the base model (GXL) and the top model (Sahara). Available with automatic transmission only, constant four wheel drive and a choice of either petrol or diesel V8 engines. The package we take on, for this road test, is powered by our preferred choice ..... the diesel. This version has a 6 speed transmission as opposed to the 5 speed unit fitted to the petrol variant. Along with the increase in size, comes the natural increase in price. Our drive package with the 4.5 litre V8 twin turbo diesel is priced from $94,750 (excluding dealer charges, statutory charges and optional extras). The V8 petrol version is $10,000 cheaper, making a heavy premium for the new diesel but somebody has to pay for research and development, no prizes for guessing that it’s the buyer. We did mention options, not that there are a lot available to enhance the ‘Cruiser’. The options are mostly for those buyers who wish to make this a tow vehicle or an off-road explorer. The towing capacity with a genuine tow bar fitted is 3,500 kg for a braked trailer or caravan and 750 kg for an unbraked trailer. Towing capacity is a strong point with the LC200; it remains unaltered from the LC100 series, which certainly made it a favourite with caravanners and horse owners. Standard equipment features are numerous and include dual zone climate control air conditioning, electric see through moon (as opposed to sun) roof, power windows with auto up/down functions on all doors, illuminated vanity mirrors for both front seat occupants and, of course, leather upholstery. Power adjustment for the front seats and steering column with rake and reach variables will suit all drivers. There are 8 cup and 4 bottle holders through out the 'Cruiser. That is one cup holder per occupant. The 4.5 litre V8 diesel engine develops its maximum power of 195 kW @ 3,400 rpm, whilst maximum torque of a whopping 650 Nm is available @ 1,600 – 2,600 rpm. This is stump pulling power! Toyota quotes fuel usage in a combined cycle as 10.3L/100 km in accordance with ADR 81/01. There is a drawback here with the VX model only having a 93 litre main fuel tank. But do not despair, there is an optional 45 litre sub tank available, note the word optional. But wait, there is more, if you select this option you can’t have the moon roof or the KDSS (Kinetic Dynamic Suspension System). What is KDSS? It is, in Toyota speak, the hydra mechanical actuation of the front and rear stabiliser bars. Other suspension features are; at the front independent double wishbones with coil springs, gas dampers and anti-roll bar, whilst the rear has 4 link coil suspension with a panhard rod with coil springs, gas dampers and anti-roll bar. Constant four wheel drive is via a centre differential, which is a Torsen Limited Slip diff; low range is available through a dash mounted dial. Stopping this hefty package weighting in at around 2,675 kg is disc brakes all round with ventilated discs with 4 piston fixed callipers up-front and ventilated discs with a single piston floating callipers at the rear. Safety features are in abundance in the LC200 VX and we will mention a few here; side door impact beams, vehicle stability control, active traction control, hill-start assist control, downhill assist control and multi terrain anti-skid braking system. All 8 seating positions have lap/sash seat belts. SRS airbags are fitted for driver and front seat passenger as well as side airbags and full length curtain airbags. Child restraint anchor (3) points are mounted on the floor behind the 2nd row of seats. Luggage tie down points are provided in the cargo area but with the 3rd row of seats in place there is very little room for luggage. 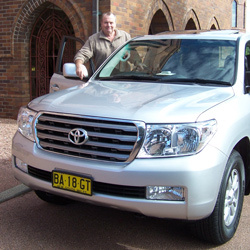 Toyota’s Land Cruiser VX turbo diesel Wagon is a large vehicle with a lot of features and we have but touched on some of these. The giant 'Cruiser' wagon offers a lot of style with comfort both on and off the hard top surfaces. The price is high, but this package is billed as “King off the Road”. I tend to believe that.